Daudi Frank enters Radio 5’s Arusha studios wearing a baggy turtleneck sweater. His trousers are stained with dirt, his plastic sandals caked with mud. The sixteen-year-old squeezes in his thin frame beside other young people from the youth outreach group Mkombozi [Saviour]. Linus Kilembu is the host of the radio program Mlango wa watoto [Children’s door]. He welcomes kids on his program every week. Mr. Kilembu asks Daudi how he copes with living on the streets of Arusha. Daudi has lived on the streets for the last five years. His father passed away when Daudi was nine, and his grandmother could not support him. He had no money for school fees, so was forced to leave school. Now, he makes his way every morning to Soko kuu, the city’s central market, where he earns a handful of shillings by selling plastic bags and bars of soap. Leah Kimaro is the program coordinator at Mkombozi, a group that reaches out to youth living on the streets. She recognized that Daudi had confidence in his own expression. So Ms. Kimaro asked him to join Mtandao wa wanahabari watoto Tanzania [Young Reporters Network of Tanzania]. The network was founded by the UN Children’s Fund, or UNICEF, and the South Africa-based Children’s Radio Foundation. It aims to equip youth across the country with media skills. The Young Reporters Network empowers youth to make real change in society. With a regular time slot every week on radio stations across the country, young people can share their views on issues like child labour, abuse, and access to education. Shaban Maganga organizes weekly radio and television programs in Mwanza, a city on the shores of Lake Victoria. Sayari ya watoto [Children’s Planet] airs on Metro FM, while Baraza la watoto [Junior Council] is broadcast on Barmedas TV. The shows are aimed at disadvantaged eight- to sixteen-year-olds. Mr. Maganga is the executive director of Mwanza Youth and Children’s Network, or MYCN. MYCN teamed up with UNICEF to use radio to get young people’s messages to the public, key decision-makers and the government. Both Mkombozi and MYCN are running into funding problems as they try to keep the radio shows on the air. Ms. Kimaro says their funding ran out last year, while Mr. Maganga sees a challenge keeping the program going beyond May 2014. 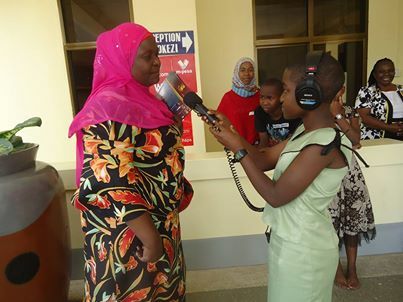 For more information on the Young Reporters Network, please go to UNICEF Tanzania. To listen to the young reporters’ radio programs, please visit its Soundcloud. Click here to watch a video created by UNICEF to highlight the work of Tanzania’s Young Reporters Network.